Connecting with students, and teens in specific, is always a challenge for anyone. Here is a book that proposes a unique and simple technique which could change all this. It´s all about the art and benefit of teaching students to ask their own questions. It is especially helpful in a classroom setting, though applications abound. Enjoy! 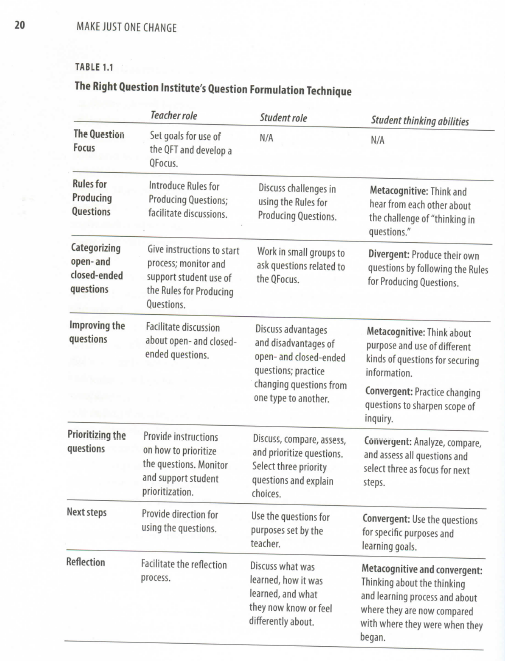 Students that go through the QFT will produce their own questions, improve them, and then prioritize them. So it’s really all about the art of developing your questions. Answering them is for another book! The students begin with a “Question Focus”, or QFocus, which is a query that focuses the starting theme. For example, the QFocus could be as simple as a word, “pollution”, or a statement, “pollution harms Boston residents”. A section of the book helps the reader produce the right QFocus, which is essential for the entire process. These rules ensure that every and as many questions as possible are recorded with ease and without interruption. This next part of the process helps students make better questions by turning their yes/no questions into open questions, and vice versa. Students see the value of close-ended versus open-ended questions which require explanations. Each team of students then chooses the most important questions they’ve come up with. In general, the technique asks you to pick the top three. Students are asked to state why they chose those questions. Throughout the whole process, after each step, the teacher asks the students to present their findings and reasons. So now what do these students do? In short, students discuss and choose the best way they wish to answer those three questions. They may choose to study the topic more at length on the internet or with a specific book, by finding more facts or creating more questions the topics touches on, by making a powerpoint or poster presentation, et cetera. This makes it interesting for the students and the teacher, because the students themselves learn the subject matter by designing their own questions and completing their own project. The image below is a summary of the entire process. Although the authors stick to the classroom setting, I think the applications reach beyond the classroom and into youth mentoring in general. For example, you can see how I applied this technique at my summer camp in my article: Connecting with Teens’ Questions at Camp. Also, I also used parts of this technique to develop “mentoring guidesheets”: A New and Effective Tool for Mentoring Teens. The immediate end result is more “student-centered learning”, that is, learning that is based off of the students’ own questions. All teachers and youth mentors have to hand on a specific curriculum, but instead of forcing students to adapt to the predetermined curriculum, this method helps adapt the same curriculum to the students. The authors of the book, Dan Rothstein and Luz Santana, report many benefits from the use of the method, which can be applied in topics from religion to history and even to mathematics. The authors note students realized the method helped them think and understand better, generate better questions, take ownership and drive their own learning, increase their interest, and even grow in confidence asking questions in public. I highly recommend this book to all teachers and youth mentors. You can obtain a copy of this book from The Right Question Institute at http://rightquestion.org. If you think this may help a teacher or youth mentor you know, please share it with them below! Thank you! Posted in Adolescence & PedagogyTagged adolescence, book review, classroom, education, faith formation, group activity, new architects, question formulation technique, questions, resource, school activity, showcase ideas, students, youth mentoringBookmark the permalink.